Quite a lot has changed since the last update two years ago, for starters there’s a lot more mud involved! 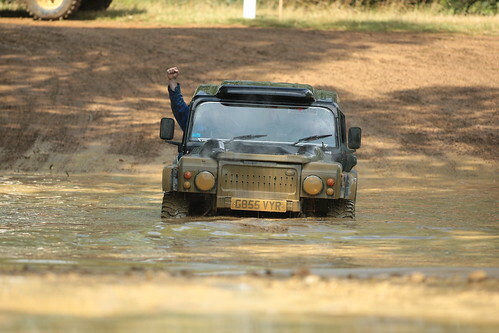 Information about the Challenge events we take part in can be found at http://www.manracing.co.uk. Breaking the ice, as it were. As I mentioned at the end of the last update, I’ve purchased a DIY 8274 holder from Devon 4×4. It looks like this. 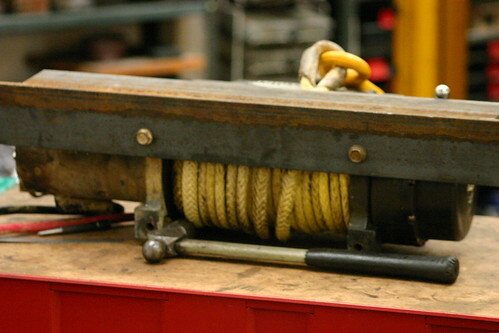 However, because nothing is ever easy, it needs modifying as my winch is wider than standard (so I can get more rope on it), and it won’t fit on the milling machine. 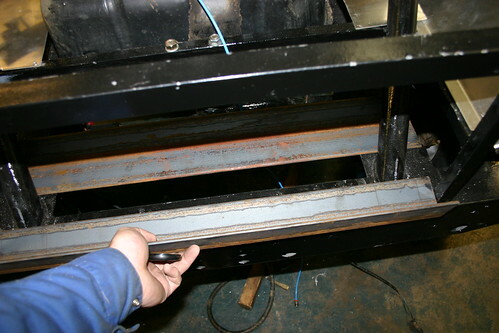 Anyway, we drilled some holes in the chassis and dropped some tube through to hold the bolts, as the chassis is perhaps a little thin on its own. Here it is in place. I perhaps need to come up with a more secure mounting system. That’s about all that’s been done recently (and I’m not going to do any more until the end of August). Someone pointed out that there’s no pictures of the back of the car since the finishing strips were added, so here is one for you. 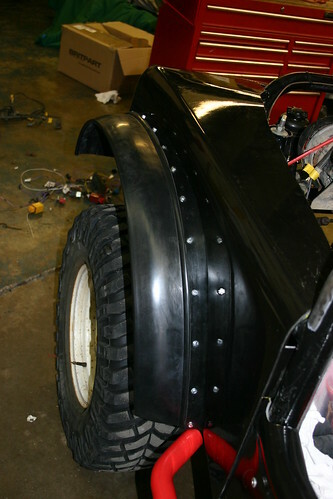 The rear, with finishing strips added. And here’s a photo to prove it actually moves! Bloody thing still hates water, though. So, suddenly, it’s Saturday 11th July, and we have less than a week left before the MOT. The list of this to do is, in fairness, pretty big. I’ll split them all up into sections, although in reality we were doing everything at once. Let’s start with the exhaust system. 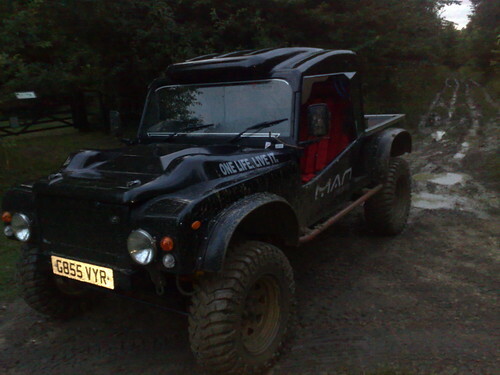 The original V8 silencer is too big to fit now, so we used one from a 200TDi Discovery. 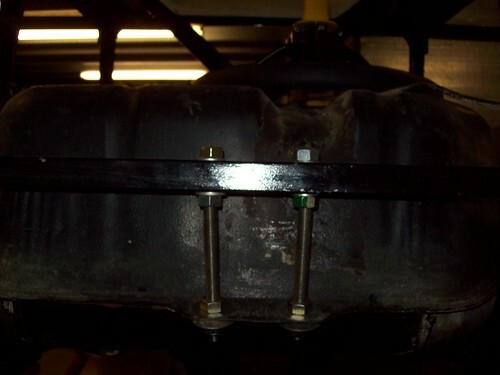 On the advice of someone from the Internet, we ditched the smaller back box entirely, cut and welded the original rear pipe (with the bend to go over the axle), shortened it at the back and put it all back together. 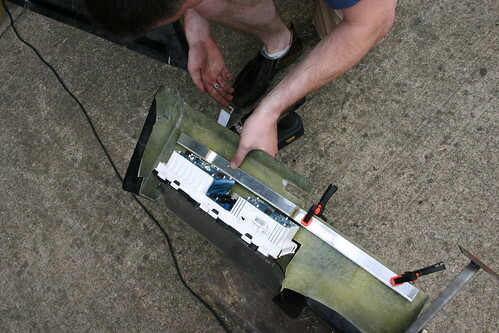 We still had no instruments or dashboard at this point, so, in the interests of saving money, we hacked a big hole in the Tomcat dashboard and fitted the original instrument cluster into it. This took a long time. 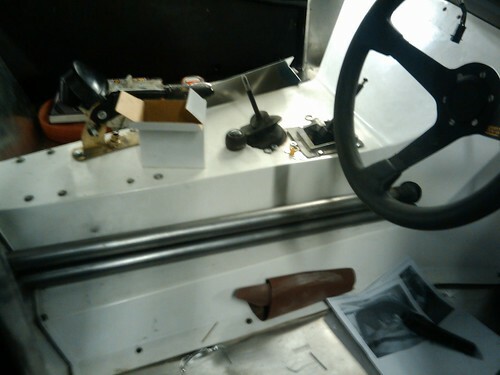 As we cut so much out, we had to add some strength to the dashboard, so we bent some ali up and bolted it in place. 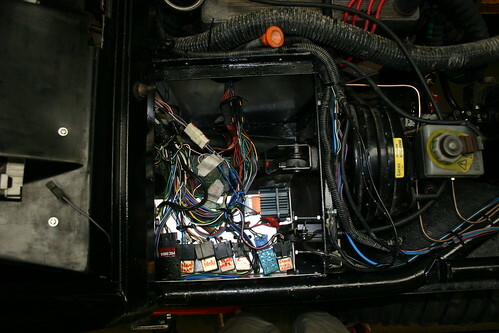 Then we cut holes for the four additional gauges (oil pressure and temperature (important as we’d ditched the oil coolers) and a voltage meter for each battery) and cut holes for all the switches. Finally, it was time to put some wires into the car. We started at the engine, then made a small tray to hold a bunch of relays in a (hopefully) water-resistant box at the top of the pedal box. We used the original ignition and indicator / light stalks, too. Then the dashboard went on, and all the switches and gauges were wired in. The wires were (mostly) hidden behind the dashboard. 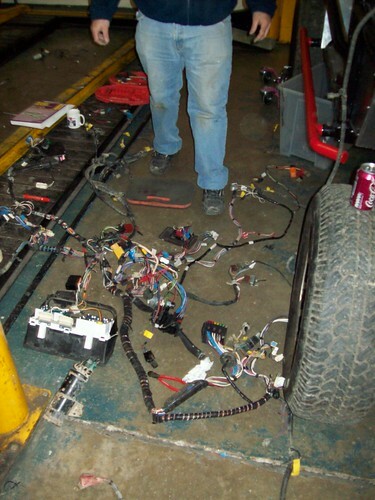 Dashboard wiring. On the left are three cigarette-lighter style power sockets. Next, we cut the holes for the headlights in the wings with a jigsaw cutter (badly) and used circle cutters to make the holes for the side lights. 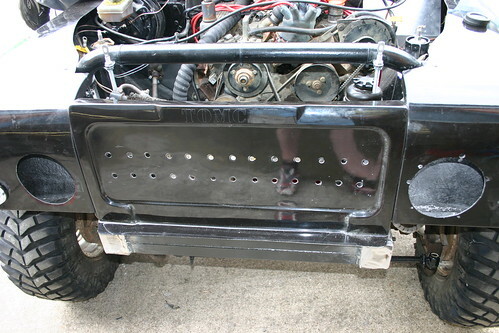 We also drilled air holes in the front panel – a temporary measure for the transmission radiator behind it. 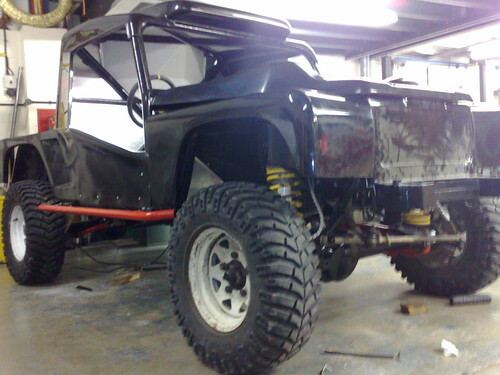 We decided we would never have time before the MOT to build a bespoke front bumper with the Warn winch, so we hacked the bits of the chassis that stuck out, too. 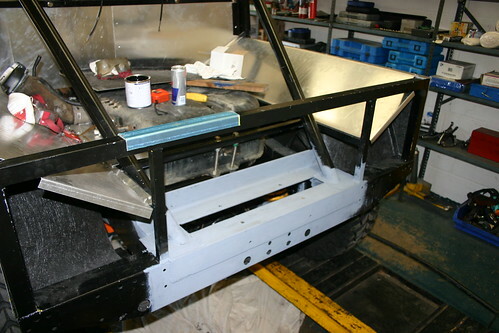 Once the front panel was bolted to the wings the whole lot became very rigid. Then (after replacing a faulty relay for the fuel pump) we fired up the engine, which was loud. Still, everything seemed to be working as expected. The original washer bottle wouldn’t fit, so we bought a small kit-car washer bottle and fitted that in front of the passenger footwell (although the original would have gone on the back of the car quite nicely). 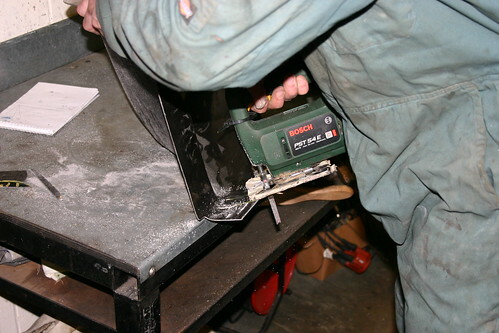 We also bolted on the ARB air compressor and made a small battery ‘stand’ out of old desk legs. 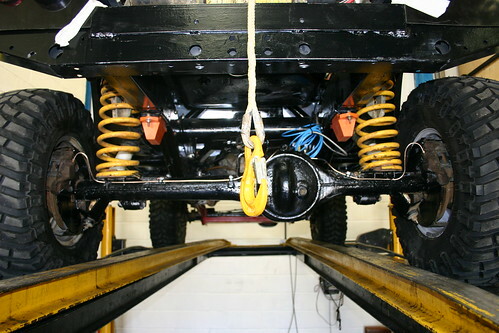 We ran the axle breathers along with the ARB diff lock lines. It was time to fit the windscreen. We purchased some Master Bond windscreen sealant from eBay, primed the windscreen and then applied a thick layer of the stuff around the edge. 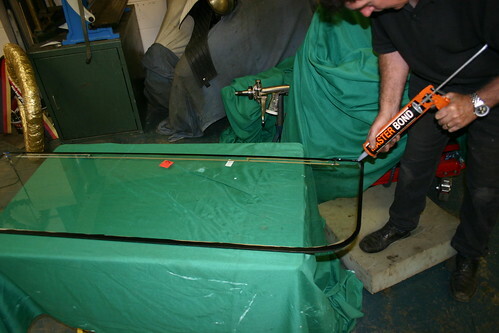 We held the windscreen in place overnight with a sophisticated tool designed just for the job. If you don’t have one like it I don’t know how you’ll manage, to be honest. Lots of relatively simple things still needed to be done. 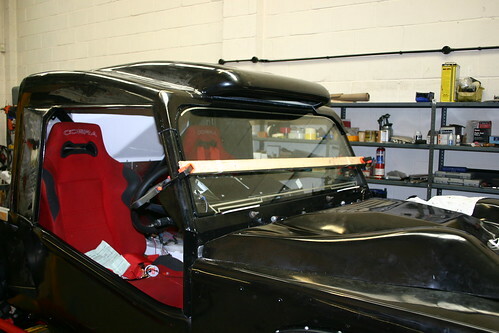 The bonnet is fixed on with some home-made brackets at the back and some proper bonnet clamps at the front, a dead switch was placed just under the windscreen in front of the passenger and we checked all the lubricants. 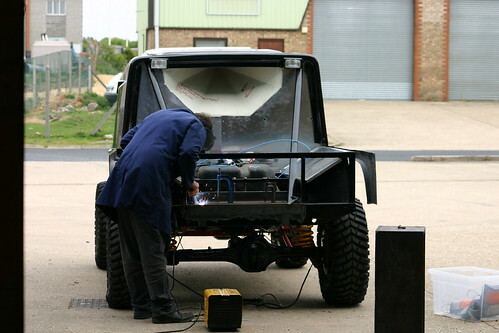 We also cut and shaped several lengths of right-angled aluminium to finish up the rear of the vehicle. And then, suddenly, we were done. We tidied up wires and rubbed off all the paint guidelines we had made, added more rivets and siliconed up some gaps in the bodywork. Stickers were stuck, windscreen wipers (some cheap 12″ ones from a local auto shop) and washers were added and then trundled off to the MOT. It failed on one thing, which was the telltale light on the Fog Light switch (which always showed as ‘on’). We fixed that in a matter of minutes, took it back to the MOT station and got ourselves a ticket. 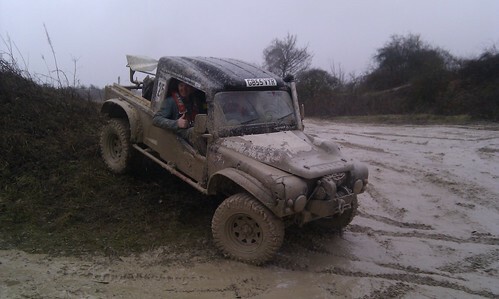 Then we taxed it, and took it through some mud! 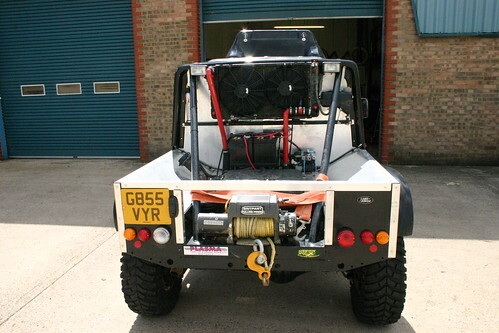 We still have bits to do – it needs places for attaching towing shackles and rings to feed the winch through (in case we need to winch upwards, or something), it needs storage for ropes and bits added, storage for the high-lift jack, waffles, spare tyre and ground anchor. 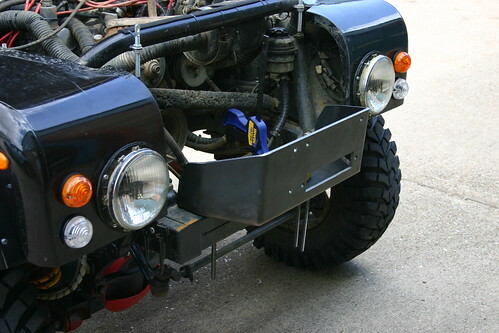 It also needs the front winch fitting, which should be much easier using the DIY 8274 winch holder I purchased from D4x4 at Billing (link). 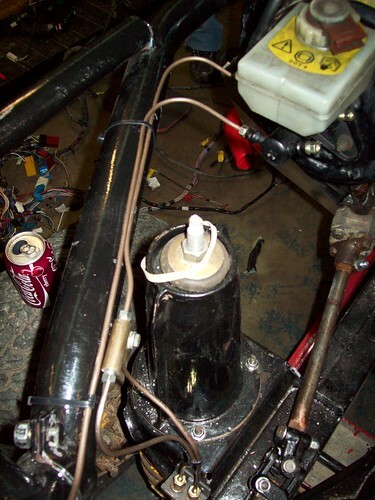 It also needs the distributor taking off and waterproofing, as it threw a fit in the water at Billing again. 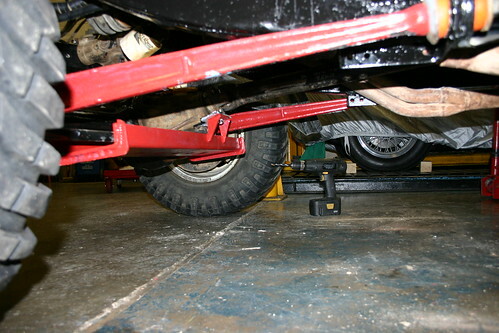 As you can see in a lot of the photos, the wheels stick out a good six inches from the edge of the body. This is an MOT fail, so it was time to buy some flexible wheel arches. 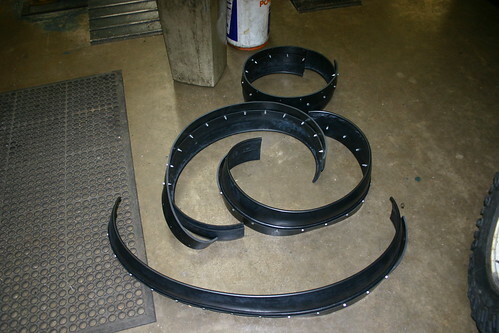 I got mine straight from Tomcat Motorsport, but wherever you go, be ready for a smack in the wallet – these chunks of rubber cost around £220! The wider ones actually come in two parts (one part is more solid rubber and you bolt some less solid rubber to it, as a six-inch lump of ‘floppy’ rubber wouldn’t be strong enough) which you put together yourself. Then we riveted them to the car. 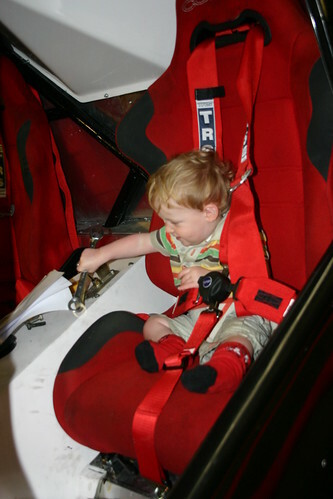 While the smallest mechanic tested out the newly-fitted passenger seat. The cooling system is finished! 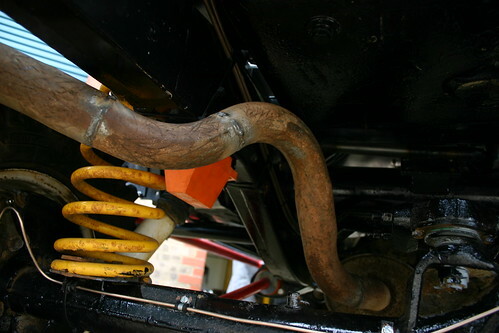 We’ve finally connected the pipes that run through the cab to the radiator. All the appropriate pictures can be seen by clicking here (I’ll add some more next week). 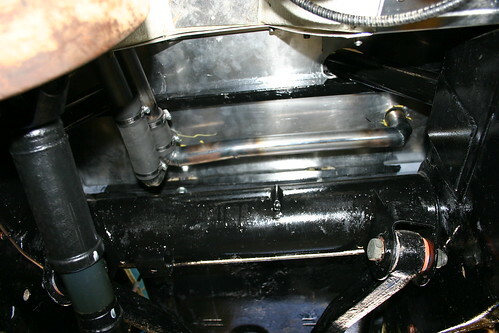 The water pipes underneath the car. The radiator is directly above them. The brake lines are finished too, and the brakes are bled and working. Here are all the brake pipe photos. 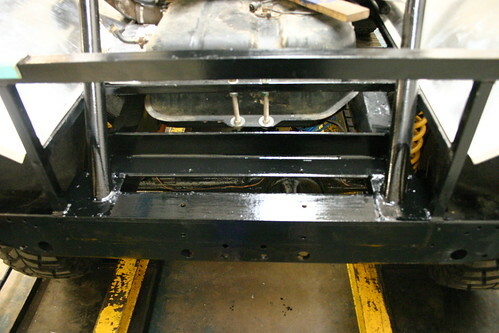 Here you can see the (nearly) finished rear axle. Note brake pipes. Also, we’ve got the driver’s seat in! This was a bit of a game as we decided not to use the supplied Tomcat seats, so the mounting points were in the wrong place. So we made up a bracket for the seat runners and bolted it in. 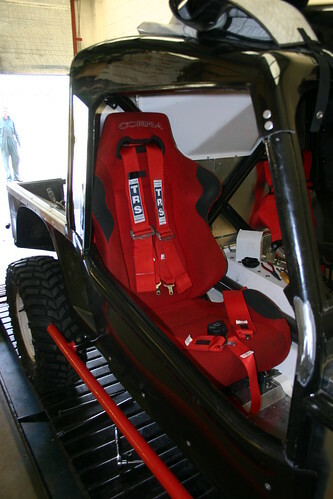 We attached the shoulder harnesses directly to the rollcage behind the seat, and the side straps to the rear bolting point for the seat. We’ll find somewhere to attach the last belt next weekend. Then we lifted the front up on the ramp, for no real reason. The blue piping is for the rear air locker. 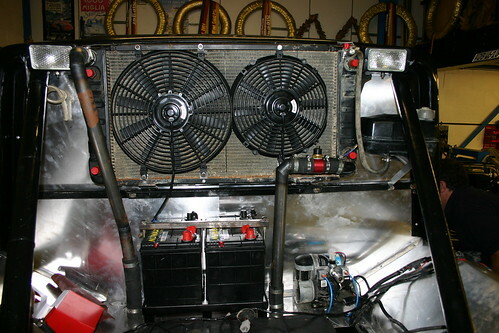 And put the lights in the rear panels. We’ll be attaching them once they’re wired up. We'll probably end up using something stronger than tape. We’ve set a self-imposed deadline of July 19th to have the car on the road, so we can take it to Billing. Then we took a look at our schedules and realised that we only have six build days left! We’ll work it out somehow. The rest of the day was spent on bodywork (again). 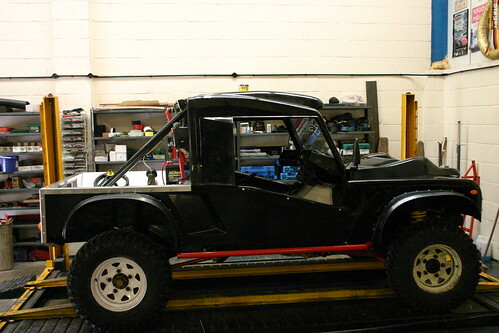 We’ve finished up the side panels, and riveted practically everything on. The only bodywork left to fix on is the front wings, rear light panels and bonnet (in so much as that is fixed). 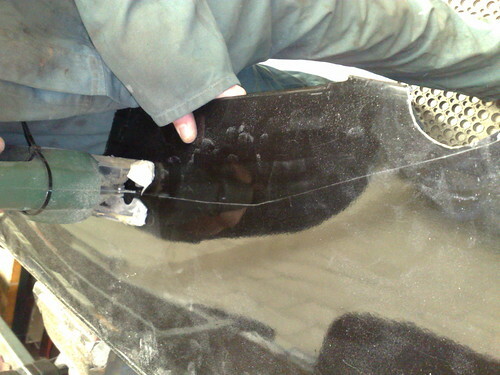 We also need to add some metal finishing strips to the rear of the car to cover up some creative bodywork adjustment. 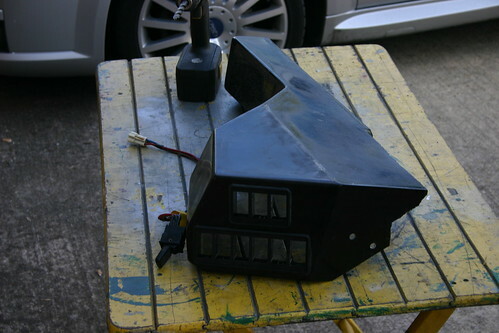 We also started to hack the dashboard to bits to make it fit around the wiper motor, with further hacking required to make the original instrument panel fit into it. We were expecting to have to do some modifying because of the number of different ways a Tomcat can be set up, but we ended up hacking huge chunks out of pretty much everything. Nothing is too complicated, but time-consuming. The side walls, in particular, went on and came off again around fifty times. Still, it’s done now. We’ve lightly rivited the panels on, in case we have to take them off to get wiring in later. 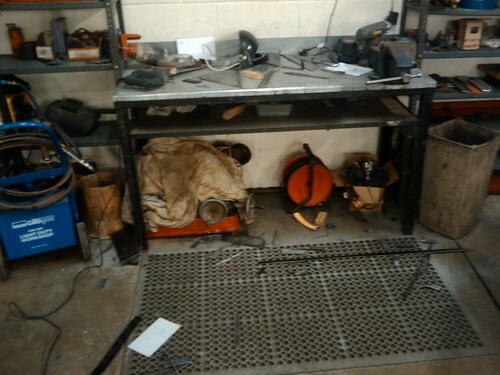 We’ll bang some more rivets in closer to the end of the build. Still, it is starting to look the part! 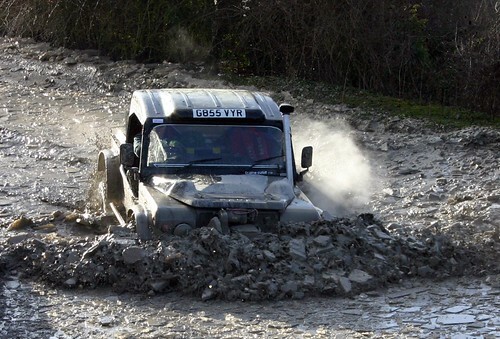 A cheap ARB-equipped diff came up for sale on a forum I look at, so that was job one this weekend. Unfortunatly my track rod protector (like this one, but bigger) had to come off first, and that required taking (hammering) a bolt from the radius arms out. The paint is coming off already. Bah. Still, now I have front and rear lockers, so that can only be a good thing, and I’ve fitted the front propshaft, so the front running gear is all done (apart from the fact that I lost the diff drain plug somewhere)! 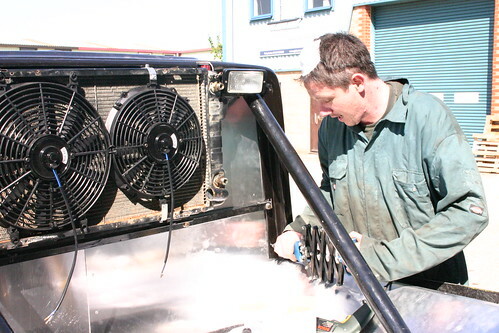 To get the water from the rear of the car to the engine, we’ve used some flexipipe and some exhaust tube to run the water through the cab, next to the driver’s seat. 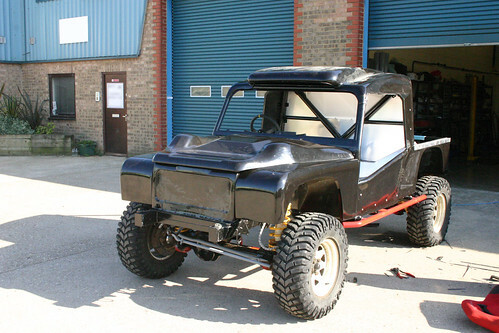 We’ll cover the tubes in heat wrap and paint them red (as required in the regulations). Now all we have to do is run tubing from the rad through the rear floor to join it all up. 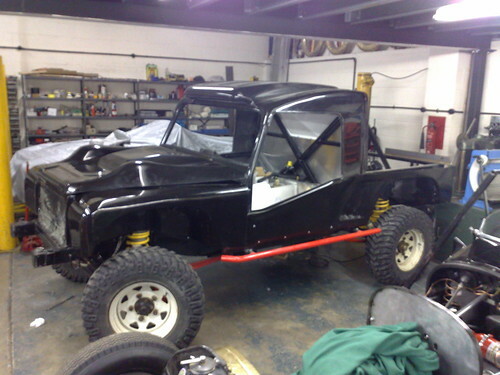 In the midst of all this, we bit the bullet and started to cut up the bodywork. The front offside inner wing (top tip: The rear inner wings are the same, whereas the the front wings are different, and will only fit one way around, depending on which side the pedal box is on) needed cutting to avoid fouling on the roll cage and a power-steering mount on the chassis, and then we rivited it on in two places in case it needed to come off again. We fitted the outer wing over the inner one, but we didn’t fix it as we still need to make the holes in it for the lights. It didn’t fit terribly well – hopefully some adjustments to the inner wing will help (we will fit the nearside wings together before mounting them on the car). 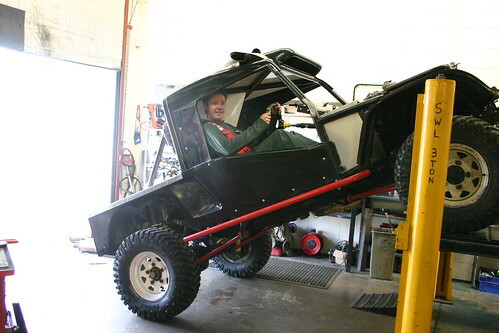 The outer wing needed cutting to avoid the rollcage, and also the top of the suspension mount. 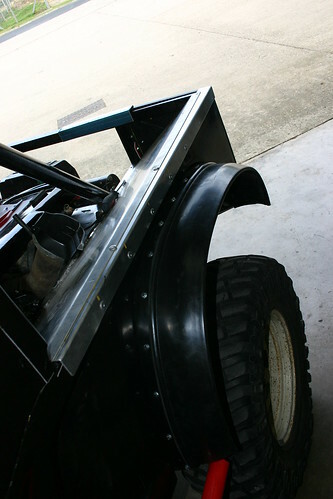 A quick note about the rear winch – I happen to have some thick angle iron that’s exactly the right size, so I’ll cut some channels into it to avoid the rear rollcage and paint it up. Hopefully that will be quite a quick job! The fuel tank is in, held level using bent studs. The front brake lines are in, too. Finally, oh dear God, we took a look at the electrics. 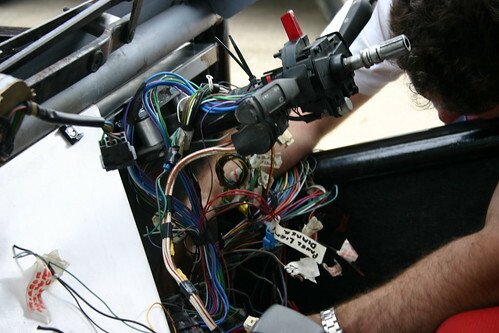 When we removed the wiring loom from the Range Rover we labelled all the wires with strips of masking tape. Since then, the labels have either fallen off or rain has washed the writing on them away. 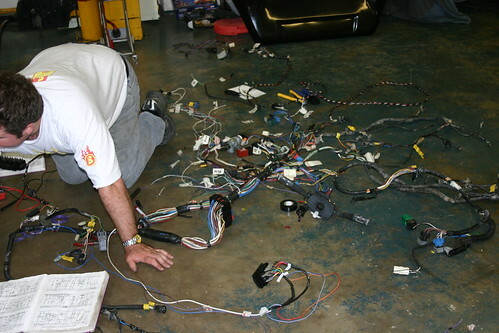 So, my brother was lucky enough to have the job of figuring it all out again, which he did by re-wiring as much stuff as he could on the floor of the workshop. This would have been easier if (a) I hadn’t ditched a load of the switches along with the body of the Range Rover, and (b) if the Haynes manual had the right colours for the wires in its wiring diagrams. Still, he got there in the end (re-labelling as he went), but there are two components we don’t recognise. 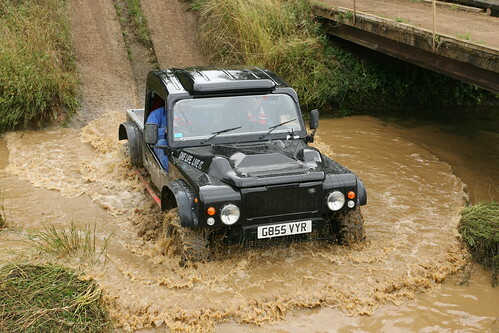 I’ve asked the clever people at the Devon 4×4 Forum what they might be, so no doubt I’ll know soon, and I’ll let you know. [Update] On the left, the central locking controller, so that can go. 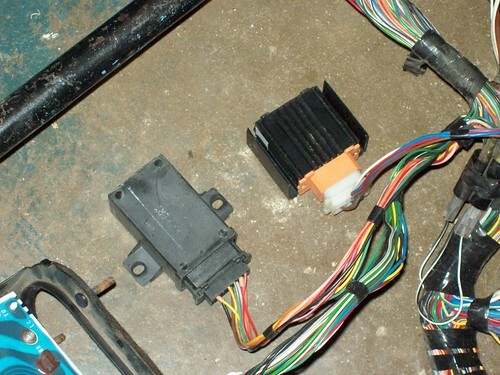 On the right, the headlight Dip/Dim controller, which has to stay. Good work, Internet!